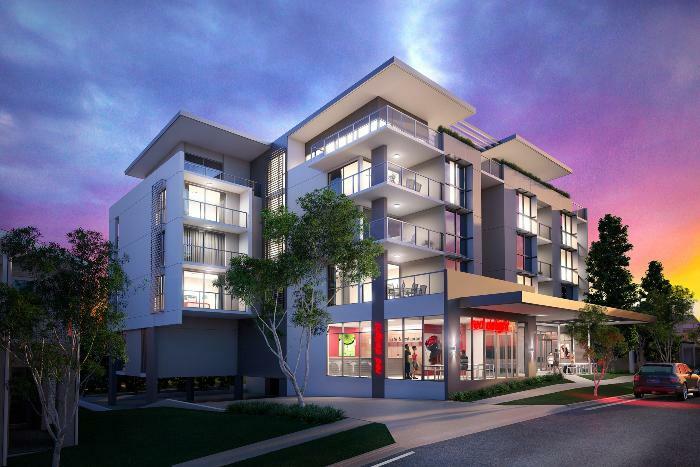 Boutique apartment developments in Brisbane’s suburbs continue to prove attractive with over 40% of Vecchio Enterprises' Lumiere project sold within the first month. These eleven sales were achieved in four weeks with strong enquiry received from both locals wanting to relocate and investors keen on its position within an established suburb. “Lumiere is seeing strong buyer interest for its boutique size as well as being located on one of the suburbs high spots. The elevated position combined with Wooloowin’s unique charm places Lumiere in a sought-after position not easily found in the current new apartment market”, says selling agent Alex Veal of Next Property Group. Lumiere’s governing design principal was to create a building that fits within the green streetscape, tailoring the design to capitalise on the northerly aspect whilst ensuring that all potential views looking south to the city were expansive. Lumiere consists of 26 two and three bedroom apartments spread over 4 levels. Whilst the three bedroom apartments are sold out, two-bedroom, two-bathroom apartments with car park are selling from $435,000. Many of the residences feature views to the city skyline. Internal features include air-conditioning, Caesar stone benchtops and stainless steel appliances, European fittings and built-in wardrobes. Wooloowin is located 6 kms north of the Brisbane CBD, and has been a major beneficiary of recent infrastructure upgrades, including the Clem 7, Airport Link inner City Bypass road links.